The CILIP Scotland Autumn Gathering event took place in Edinburgh on Thursday 30 October 2014. Although the CILIP Scotland Web site provides information about the event, a more comprehensive set of resources can be found on the Lanyrd entry for the event, including links to speakers’ slides (where available), additional speaker information, links to archives of event tweets, etc. The highlight of the day’s event for me and other participants was the opening plenary talk on “Full Disclosure: Hillsborough and the human side of information work” given by Jan Perry, the CILIP Vice President (and President in the new year). In the presentation Jan described her work with the Hillsborough Independent Panel. This was a very moving presentation, especially for someone, like me, from Liverpool -and although I’m from the blue half of Liverpool hearing about Jan’s involvement with the independent panel for the Hillsborough disaster brought back particular strong memories as my dad died around that time. Listening to talk about Hillsborough, The Sun, etc at #CILIPSAG14 is making me feel angry. Memories of 80s: miners strike, Thatcherism. #CILIPSAG14 Jan Parry describing her role in the Hillsborough enquiry and proving information really is power. Unfortunately there was no time for questions but over the coffee break I was able to thank Jan for her talk; she told me that I was not alone in my emotional response to the talk. 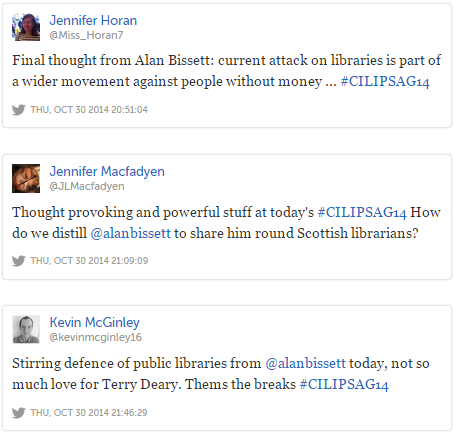 Thought provoking and powerful stuff at today’s #CILIPSAG14 How do we distill @alanbissett to share him round Scottish librarians? The reminder of the CILIPS Autumn Gathering consisted of parallel sessions. As I mentioned previously I had been invited to facilitate a session on “Why and How Librarians Should Engage With Wikipedia”. During the session I gave reasons why librarians should engage actively with Wikipedia, not only understanding some of the hidden secrets behind the service but also why they should be willing to update Wikipedia articles and even create new articles. Prior to discussing the creation of an article, I updated the Wikipedia article for CILIP to include details of the membership numbers since CILIP was founded in 2002. As can be seen from the figures shown below there has been a drop in the membership numbers every year since CILIP was founded (note where possible the figures have been taken from CILIP annual reports but not all annual reports are available). The decline in CILIP membership numbers has been a bone of contention over recent years. It would probably therefore be inappropriate for a Wikipedia user who is employed by CILIP to comment on the membership trends, as this would conflict with the neutral point of view principle. I would, however, suggest that if a CILIP employee has access to membership numbers for 2002 and 2004-2006 these could be added to the table, ideally with a comment on the talk page declared a vested interest. I used this example when I address the suggestions that there should be a Wikipedia article for CILIPS. On Wikipedia, notability is a test used by editors to decide whether a given topic warrants its own article. Information on Wikipedia must be verifiable; if no reliable third-party sources can be found on a topic, then it should not have a separate article. Wikipedia’s concept of notability applies this basic standard to avoid indiscriminate inclusion of topics. Article and list topics must be notable, or “worthy of notice”. Determining notability does not necessarily depend on things such as fame, importance, or popularity—although those may enhance the acceptability of a subject that meets the guidelines explained below. However in discussions I discovered that CILIPS has its own governance, its own web site and as involved in consultations with the Scottish Parliament for the development of the National Library of Scotland Bill 2011. This would seem to make it appropriate for there to be a Wikipedia article for CILIPS. We then discussed the need for content to be provided by contributors who have a neutral point of view. I suggested that the talk page for the CILIP article could provide a forum for discussions about the creation and evolution of a CILIPS article. However as I concluded the session I was informed that a CILIPS article already exists! 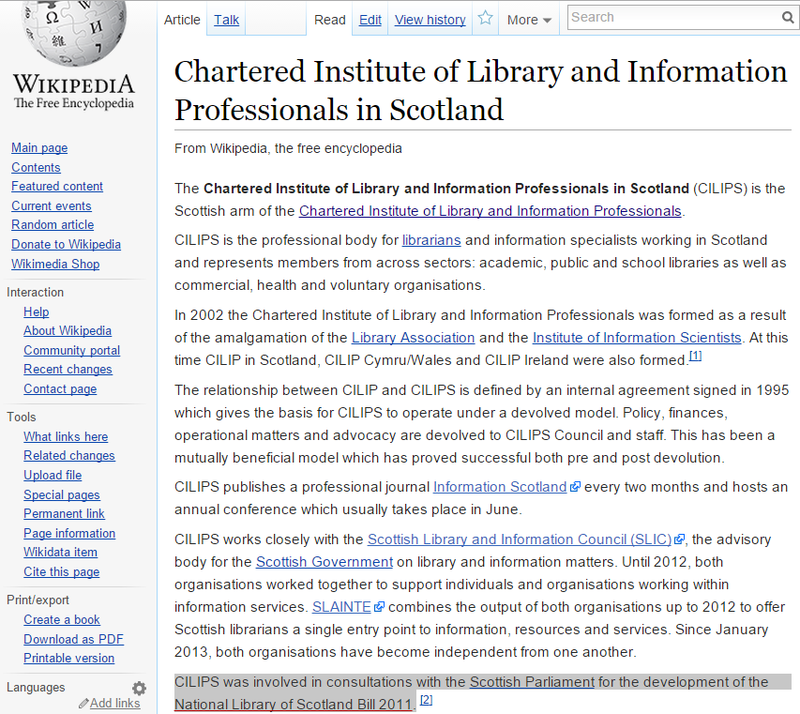 The Wikipedia article, entitled Chartered Institute of Library and Information Professionals in Scotland, is shown. Looking at the history for the page we can see that it was created on 5 November 2013. However on 9 August 2014 it was proposed that the article should be deleted. In response one user “added a reference to a Scottish Parliament document. I believe this organization is sufficiently notable to remain given that they were consulted in writing a national library bill.” It would appear that this information provide sufficient evidence of the notability of the organisation. I began this post by describing two plenary talks which described organisations (the police force and the Labour party in Scotland) whose reputations have been undermined through a loss of trust. We are not in that position with libraries. And yet librarians and information professional should not rest on their laurels. In my talk (the slides are available on Slideshare and embedded below) I spoke about the close parallels between librarians and Wikipedia, both of which aim to provide neutral and unbiased access to information. Wikipedia had documented its core principles which aim to ensure that Wikipedia provides a neutral source of information. A while ago I came across an article entitled “So who’s editing the SNHU Wikipedia page?” which described how analysis of editing patterns and deviations from the norm may be indicative of inappropriate Wikipedia editing strategies, such as pay-for updates to institutional Wikipedia articles. On behalf of our firms, we recognize Wikipedia’s unique and important role as a public knowledge resource. We also acknowledge that the prior actions of some in our industry have led to a challenging relationship with the community of Wikipedia editors. Our firms believe that it is in the best interest of our industry, and Wikipedia users at large, that Wikipedia fulfil its mission of developing an accurate and objective online encyclopedia. Therefore, it is wise for communications professionals to follow Wikipedia policies as part of ethical engagement practices. Beyond our own firms, to take steps to publicize our views and counsel our clients and peers to conduct themselves accordingly. We also seek opportunities for a productive and transparent dialogue with Wikipedia editors, inasmuch as we can provide accurate, up-to-date, and verifiable information that helps Wikipedia better achieve its goals. A significant improvement in relations between our two communities may not occur quickly or easily, but it is our intention to do what we can to create a long-term positive change and contribute toward Wikipedia’s continued success. If we wish to maintain the level of trust which librarians currently possess and we wish to see librarians supporting use of Wikipedia, should there be a similar statement of neutrality for those who are members of CILIP and CILIPS? This entry was posted on 3 Nov 2014 at 3:39 pm	and is filed under Wikipedia. 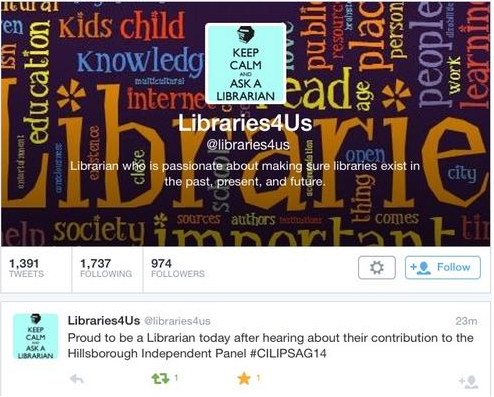 Tagged: CILIP, cilipsag14. You can follow any responses to this entry through the RSS 2.0 feed. You can leave a response, or trackback from your own site.